A few weeks ago I set out to make a spice cake. 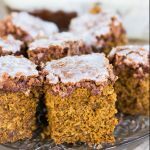 I thought it would be easy to find a good spice cake recipe, but it turned out to be a lot harder than I thought! After searching for several hours (I wish I was exaggerating!) and not finding the perfect recipe, I decided to adapt a recipe from America’s Test Kitchen. I really wanted to make a layer cake, but a lot of spice cake recipes are sheet cakes so that eliminated lots of recipes right off. I really didn’t want any “other” flavors added (apple, pumpkin, etc), so that eliminated several more recipes. And of course, I wanted to start from scratch and a surprising number of recipes I found started with a cake mix. I searched and searched for a recipe that met my requirements and had good reviews/comments. I was really close to making up my own recipe, but I wasn’t confident that I could get the spice combination right without multiple attempts so I took a chance and decided to make the ATK spice cake recipe in layers instead of a 9×13 pan. I know it doesn’t sound like that much of a gamble (ATK recipes are awesome! ), but some sheet cakes have such a light, delicate crumb that you can’t really stack them. 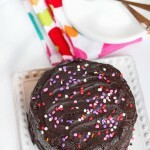 Fortunately, this recipe worked perfect as a layer cake too! The cake has a very nice, light, delicate crumb, but was still sturdy enough to stack without falling apart. And the spice combination was spot-on! 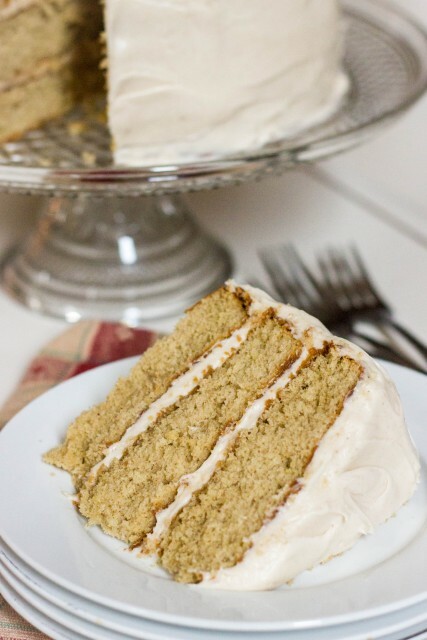 You definitely know it’s spice cake, but it’s not too spicy and no one flavor overpowers the others. 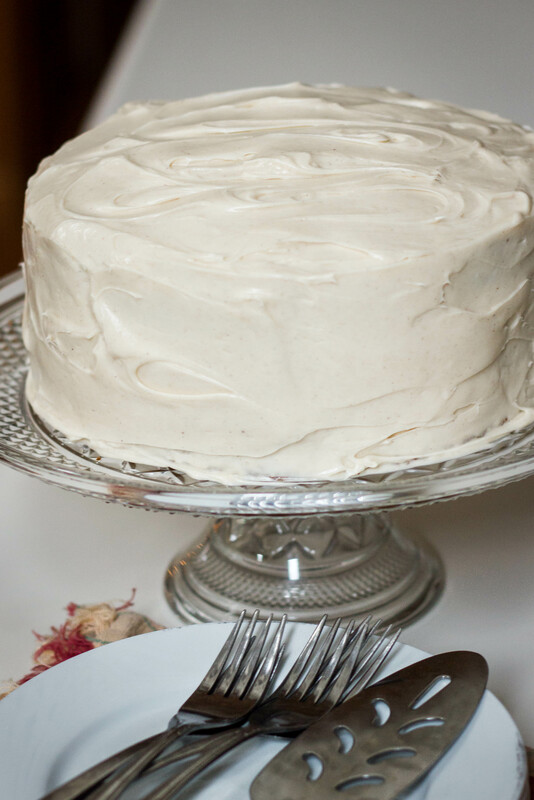 I finished it off with a simple cinnamon cream cheese frosting. You could easily fancy it up some by piping the frosting, garnishing with some sprinkles, or even a dusting of cinnamon on top. Or you could just spread the frosting on with a knife and dig in! That’s what I did =). Enjoy! 1. For the cake: Adjust oven rack to middle position and heat oven to 350 degrees. Line 3 (9 inch) round cake pans with parchment paper and spray lightly with nonstick spray. Combine spices in small bowl. 3. Whisk flour, baking powder, baking soda, and salt in medium bowl. In small bowl, gently whisk eggs, yolks, and vanilla to combine. In standing mixer fitted with paddle attachment, cream remaining 12 tablespoons butter with sugar and molasses at medium-high speed until pale and fluffy, about 3 minutes, scraping down sides and bottom of bowl twice with rubber spatula. Reduce to medium speed and add cooled butter and spice mixture and half of egg mixture; mix until incorporated, about 15 seconds. Repeat with remaining egg mixture; scrape down bowl again. Reduce to low speed; add about one-third flour mixture, followed by half of buttermilk, mixing until just incorporated after each addition, about 5 seconds. Repeat using half of remaining flour mixture and all of remaining buttermilk. Scrape bowl and add remaining flour mixture; mix at low-medium speed until batter is thoroughly combined, about 15 seconds. Remove bowl from mixer and fold batter once or twice with rubber spatula to incorporate any remaining flour. 4. Divide batter evenly between prepared pans. Lightly tap pans against counter 3 or 4 times to dislodge any large air bubbles; smooth surface with spatula. 5. Bake until toothpick inserted in center of cake comes out clean, 20-25 minutes (Time may vary depending on your oven and if you use dark/light pans. My cake pans were dark.). Cool in pans on wire rack for 10-15 minutes. Then remove from pans to cool completely. 6. To make the frosting: combine butter and cream cheese in bowl of stand mixer. Beat with paddle attachment on medium speed until smooth. Gradually beat in powdered sugar on low speed. Add vanilla and cinnamon and beat for a couple minutes more, until light and fluffy. 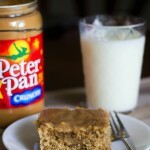 As you beat it, the frosting will loosen up but if you feel like your frosting isn’t spreadable you can add a teaspoon or two of milk until you reach your desired consistency. However, since this is a layer cake you want your frosting to be fairly stiff so your layers don’t slide apart. 7. To assemble cake, place on cake layer in center of cake stand. Top with about 1/2 cup frosting and spread to edges. Repeat with 2nd cake layer. Top with 3rd cake layer and spread frosting evenly over top and edges.